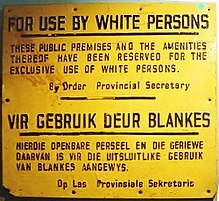 Apartheid (an Afrikaans word meaning apart-ness) was a system of legal racial segregation enforced by the National Party government of South Africa between 1948 and 1994. Also called "separate development," apartheid curtailed the rights of the majority "non-white" inhabitants of South Africa and maintained minority rule by white people. The government of South Africa also practised the same policies of racial separation while occupying South-West Africa, known after 1966 as Namibia. From 1970, black people were deprived of their citizenship, legally becoming citizens of tribally-based self-governing homelands called bantustans, four of which became nominally independent states. P. W. Botha as MP of George, House of Assembly, 7 September 1948, cited in Dictionary of South African Quotations, Jennifer Crwys-Williams, Penguin Books 1994, p. 251. I am one of those who believe that there is no permanent home for even a section of the Bantu in the white area of South Africa and the destiny of South Africa depends on this essential point. If the principle of permanent residence for the black man in the area of the white is accepted then it is the beginning of the end of civilisation as we know it in this country. P. W. Botha speaking to parliament on 11 May 1964 as Minister for Coloured Affairs, as cited in The Guardian 7 February 2006. There is not an Indian community in the world that is better off than the Indians in South Africa. That is the type of apartheid that I stand for. That is the type of apartheid that is not dead. P. W. Botha cited in Country of My Skull, Antjie Krog, Random House, p. 270. Our enemies latched unto the word "apartheid" and in a very sly manner transformed it into the strongest weapon in the onslaught against freedom and civilization in our country. P. W. Botha cited in Dictionary of South African Quotations, Jennifer Crwys-Williams, Penguin Books 1994, p. 22. The anti-apartheid movement in the '80s... he (Howard Zinn) was there. ...He put everything there, because he cared very deeply that these things were wrong -- that apartheid was wrong... that was the early '80s, and there were people who didn't really think it was so bad. That's the thing. A lot of times we look back and we remember how radical it was to confront apartheid. Now, everyone looks back and knows it was wrong... That's why dissent is so important, because it creates an atmosphere in which people can explore alternative ways of thinking. That's something I took from Howard. That's what Howard taught. That's why he still matters. Huh, not much bloody "Unitate" about this place! Friedrich Hayek, "Conversation with Systematic Liberalism," Forum (September 1961). I grew up with two inheritances — the ability to speak and write and fight in the English language, on the one hand, and a deep suspicion of the English as racial hypocrites whose liberal pretence helped them escape the harsher criticism of apartheid reserved for white Afrikaans speakers, on the other. … But while Afrikaans has, rightly, been the target of political ridicule, English and the English continue to labour under what political studies professor Herman Giliomee famously called “the illusion of innocence”. America—and that means all of us—opposes apartheid, a malevolent and archaic system totally alien to our ideals. If we consider what Merton College and what the Oxford School of English owes to the Antipodes, to the Southern Hemisphere, especially to scholars born in Australia and New Zealand, it may well be felt that it is only just that one of them should now ascend an Oxford chair of English. Indeed, it may be thought that justice has been delayed since 1925. There are of course other lands under the Southern Cross. I was born in one; though I do not claim to be the most learned of those who have come hither from the far end of the Dark Continent. But I have the hatred of apartheid in my bones; and most of all, I detest the segregation or separation of Language and Literature. I do not care which of them you think White. Apartheid means: ‘something of your own’; ...separate development means the kind of growth which one creates by means of own power and for the sake of yourself and your people. ... the policy of separate development [i.e. apartheid] can be tested by any unprejudiced person against the requirements of Christianity and morality, and it will be found to meet all those requirements. [D]oes legality establish morality? Slavery was legal; apartheid is legal; Stalinist, Nazi, and Maoist purges were legal. Clearly, the fact of legality does not justify these crimes. The whole ethos of apartheid is man's inability to live peacefully with people of another race, unless the races are divided into their own homelands. Simonstown not only was a living witness that this could happen, but it had been happening for over one hundred and fifty years. It was a living reproach to the rest of South Africa, a scandal in our midst, a blight which had to be got rid of. The majority of the Coloured people were swept from their homes to a township where they will live alone. This township with the ominous name of Slangkop is situated in the wind raked sand dunes on the isolated slopes nine miles from Simonstown. A sad and gaunt air hangs like the driven sand over the place. The pleas and the wishes of the Coloured population went unheeded. Separate development decreed otherwise. The Rt. Revd. Colin Winter, Anglican bishop of Damaraland (Namibia), on the relocation of the Coloured population of Simonstown, South Africa, under the Group Areas Act when he was a parish priest there. Colin Winter, Just People, London: Society for Promoting Christian Knowledge (1971), p. xiii. ISBN 0281026041 "Slangkop," the place name mentioned in the quotation, means "snake head" in Afrikaans. This page was last edited on 10 February 2019, at 22:28.